Typical product of southern Italy, it stands apart from the rest thanks to its bright red colour which means the tomatoes have been dried in the southern sun and are brought back inside at nightfall to prevent the smokiness caused by dew and damp. As they are not dried in a drying house, they are softer on the palate and tastier. They can be used as a starter, or we can chop them up to use in pasta dishes, perhaps adding a drizzle of olive oil, basil, oregano, capers and a bit of tomato sauce. We can use them in panini or sandwiches, by adding mayonnaise or soft cheese and mixing in a mixer or food processor. A quick, fancy idea for your aperitifs. Take a small mozzarella, wrap it in a sun-dried tomato, and fasten with a toothpick. Dress with a drizzle of extra virgin oil and a light sprinkling of oregano. The porcini mushrooms are processed when dried to highlight their flavour and fragrance. 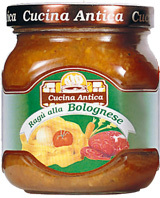 Ideal sauce for egg pasta, preferably long (tagliatelle) or risottos. 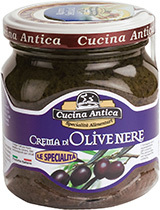 Can be used with polenta, either fresh or grilled, with meat, as a sauce for cutlets, roulades or fillets. It is a tomato sauce with clams. 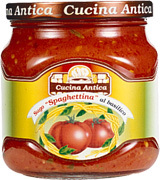 Ideal sauce for pasta, preferably long semolina pasta, or it can be used to enrich fish soups, crostoni and pizzas. Serve it with parsley to bring out the product’s fresh image. Cream with a thousand uses with a pleasant, lingering truffle aroma. Can be used both hot and cold for tarts, bruschettas, sandwiches, pizzas, etc. 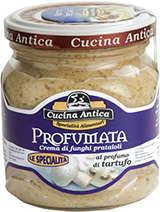 Can be mixed with soft cheeses or mayonnaise to fill choux pastry balls, cannolini, vol-au-vents etc. If lengthened with cream or melted cheese or a drop of milk, ideal for pasta dishes using egg or semolina pasta and rice. Excellent dressing for potato gnocchi or truffle lasagne: make 5 layers with strips of egg pasta, béchamel and diluted truffle cream, cubes of ham and slices of fontina. When you have made the 5 layers, put it in the oven to bake for around 30 minutes at 180°C. Can be used as a sauce on cutlets, fillets, to add flavour to mixed minced meat in order to make aromatic meatballs or fillings for roast meat, or to spread on meat to create stuffed roasts. It is a very versatile sauce that tickles the imagination, so you’ll try it in lots of different ways. A sauce with a delicate mix of fragrances and flavours, exclusive to our company, at a very competitive price. Sauce with tomatoes processed during the season. With a base of onion, olive oil, a higher percentage of basil and very little fat. Arrabbiata sauce is ideal for penne or short ribbed pasta. Add freshly chopped parsley and a drizzle of extra virgin olive oil. 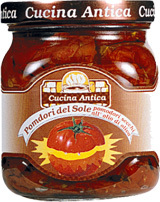 Typical italian sauce, can be used for bruschettas or for all recipes requiring tomato to give a fuller flavour. If you want, you can use it with borlotti beans to make a tasty dip or with Mexican black beans for tortillas.